We’ve got our eyes on The Golkonda Resort and Spa — a luxury resort located in Gandipet. It’s a great choice to surprise bae on an anniversary and has unique stay offers too. A testimony of the royal lifestyle of Nizam’s Hyderabad, this resort is actually a modification of a magnificent guest house built in 1917. It is nestled amidst lush greenery and offers a stunning view of the Osman Sagar Lake. There are multiple villas here that you can check into, each with its distinct interiors and ambience. Although we are impressed by each of them, we’d recommend staying at the Palm Villa for it has a fountain/garden view. and a cushy king-sized bed. Walk into pretty wooden interiors that match the earthy wall colours. Matching curtains and a king-sized bed complete the ambiance. With a mini bar, spacious wardrobes and bathtub along with a satellite TV and high-speed internet access in this villa, you won’t feel completely disconnected (Way too pleased if anything). Most of all, it’s the views from the window panes that will make you feel like you’ve transported to a region with palm trees like Goa. Although the atmosphere of the resort is tranquil in itself, it also has a spa to rejuvenate your mind, body, and spirit. If you’re wondering about the food, they do have breakfast options (not included in fare), but there’s Jewel Of Nizam too. 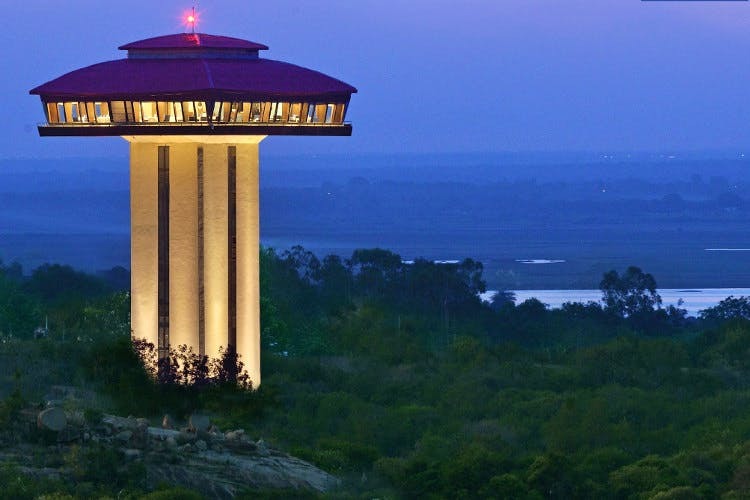 A restaurant on a 100 feet minar which is an experience in itself. Reserve a window seat and dine on Mughlai and Hyderabadi cuisine in luxury. We recommend making bookings asap as the demand might be high during the Valentine's Day.